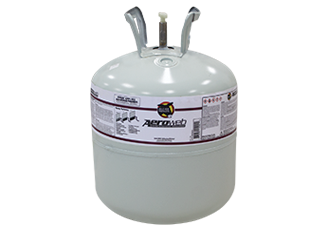 Quick and even aerosol coverage – Up to 60% labor savings on installation time versus a traditional roller-applied adhesive. Enhanced coverage rate with AeroWeb applied to 75% of the surface versus 100% coverage with roller-applied adhesive. Does the canister need to be agitated? It is recommended contractors shake the tank for 15-20 seconds before each use. What equipment is needed to install AeroWeb? The AeroWeb system consists of three major parts: cylinder, hoses and gun. Guns are available with or without an ergonomic extension (useful for horizontal applications). All parts are sold separately. Use lithium grease or petroleum jelly on all fittings to prevent dried adhesive from clogging or seizing. Hoses and guns may be reused multiple times if maintained properly. The end of the gun should be cleaned with an appropriate solvent (i.e. acetone) at the end of each use and new grease or petroleum jelly applied. When changing to a new cylinder, close the valve and depressurize the hose. Remove the hose and attach it to a new cylinder. If the hose isn’t transferred to a new cylinder immediately, empty the hose and spray gun to ensure product does not harden in the hose and gun. When there is product in the cylinder, always keep the cylinder valve open to maintain pressure in the hose when not in use. Are there temperature restrictions with AeroWeb? AeroWeb can be used in temperatures as low as 25°F. The tanks and material must be kept at 60°F or warmer. 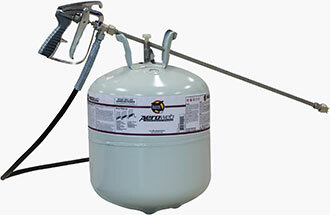 When applying in ambient temperatures below 60°F, store the cylinders in a heated space until ready to apply. The cylinders must be kept warm on the jobsite. Do not use cylinders for tarp weight when ambient temperatures drop below 60°F. When the material becomes too cold, it will begin to “spit” rather than spray from the gun. If this happens, switch it out for a warm cylinder. What is needed to clean up and prep for next use? Use a safe solvent, mineral spirits or acetone depending on VOC regulations to clean tools and surfaces If the spray gun valve becomes stuck, attach the hose and spray gun to a cylinder of citrus cleaner or Low-VOC UN-TACK and trigger the gun until it operates smoothly. If the tip becomes clogged, use a small-gauge wire or torch clean-out tool after soaking the fitting in Low-VOC UN-TACK. How are cylinders disposed when empty? The hose and gun are reusable. In most areas, the empty cylinder can be disposed as an aerosol can or recycled as scrap metal. Federal law forbids transportation if refilled. AeroWeb is compliant across all 50 states including California. Current California VOC compliance requires meeting less than 250 g/L VOC. AeroWeb is 206 g/L.